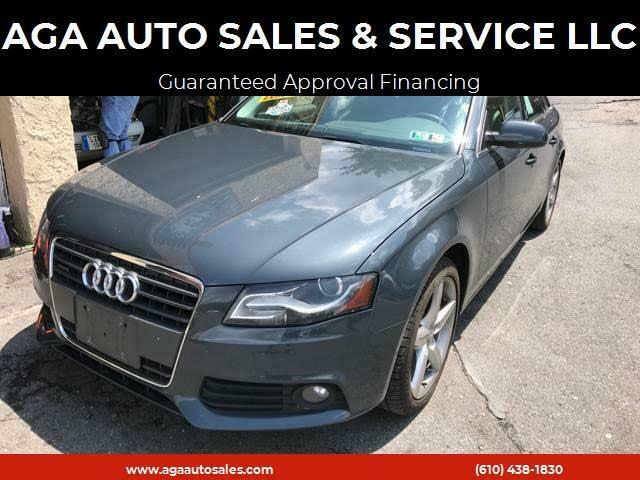 Used 2011 Audi A4 2.0T Sedan quattro Tiptronic for Sale in Easton PA 18042 AGA Auto Sales & Service LLC. FULLY LOADED CAR. SUNROOF,? AUTOMATIC SEATS,? HEATED SEATS,? MEMORY SEATS,? AUTOMATIC SUNROOF,? CRUISE CONTROL,? NAVIGATION,? BACKUP CAMERA. ALL WHEEL DRIVE. WELCOME TO AGA AUTO SALES AND SERVICE WHERE EVERYONE IS APPROVED. WE SELL FOR LESS.WE FINANCE GOOD,? BAD,? OR NO CREDIT. ASK ABOUT OUR GUARANTEED CREDIT APPROVAL. Family owned & operated. Most of our vehicles include a 3 months warranty & have been serviced & inspected.